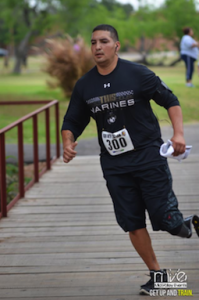 Sgt Jacob De La Garza grew up in Edinburg, Texas where he eventually joined the Marine Corps in 2003 and went to boot camp in San Diego, Ca. Upon completion of boot camp he went to the School of Infantry and became a 0311 rifleman a Grunt. He went on to serve in 3rd Battalion 1st Marines from 2004-2008 where he did 3 combat deployments with that unit in support of operation Iraqi Freedom. From 2008-2010 he served as a Combat Instructor at The Basic School in Quantico, Va. In 2010 he got orders to 1st Battalion 5th Marines and deployed in support of Operation Enduring Freedom. During that deployment to Afghanistan he was struck by an Improvised Explosive Device during a foot patrol. He took fragmentation to left elbow, laceration to the right leg and severe damage to his left leg. He was medically evacuated out of Afghanistan and sent to the Naval Medical Center San Diego (Balboa). His left leg had to be amputated due to the severe injuries he sustained. He was medically retired in 2012 and now resides back in his hometown of Edinburg, Texas. He enjoys staying active and participating in various athletic events to stay motivated and to inspire and influence others. He has future goals of pursing a college degree and he takes advantage of any new challenge and opportunity that comes his way.